ABA Techshow Attendees: Win a Copy of my Book "Cloud Computing for Lawyers"
ABA Techshow attendees--want to win a free copy of my ABA book Cloud Computing for Lawyers? All you have to do is drop off your business card at the MyCase booth (#314). Then, tomorrow at my "Meet the Author" session (Friday from 1:45-2:15 in the author lounge), I'll draw a card randomly and if that person has the correct answer and is at the session, s/he will win a free copy of my book. So, drop of your business cards and I'll see you tomorrow! On Wednesday, I hop onto a plane and fly into lovely Chicago for the annual ABA Techshow, one of my favorite conferences. If you're going to be there, let me know and I'll add you to my ever-growing Twitter list of Techshow attendees. You can download the offical ABA Techshow mobile app here. This app includes the official calendar of events, including sessions, Taste of Techshow dinners, etc. It also includes a list of attendees and vendors. For a look at the social side of Techshow, including "unofficial" social events, check out Lanyrd.com and their accompanying mobile app. This app allows attendees to take control of their social experience at Techshow. You can create your own profile, including a photo, short bio, and link to your Twitter account. In my bio I included my cell phone number to faciliate communication throughout the conference. The ABA Techshow event on Laynrd can be found here. I've populated the app with information about Techshow, including links to blog posts about the event and I created "sessions" which correspond to the public social events that I'm aware of, all of which are listed below as well. The app supplements the official ABA Techshow app and allows users to create their own social Techshow experience. Once you add your profile to the app and indicate that you're attending Techshow, you can also add events, whether it's an "unofficial" social event that I missed or an event of your own making, such as an impromptu happy hour. In addition you can add links to any other coverage of Techshow. This app should facilitate the social experience of Techshow since it give all attendees that choose to use it a more accessible bio, along with a photo, and you can include whatever contact information you would like in your bio. And, it puts all social events and press or blog coverage in one easily accessible location. So, check it out. Also, I strongly suggest you download the "Bump" mobile app as well. It makes it easy to quickly exchange contact info with other attendees simply by "bumping" your phones together. Wednesday March 28th, 7 pm--Lexthink1 event. It's sold out but you can still sign up for the waiting list. Wednesday March 28th, after Lexthink1--NetDocs/LegalTypist happy hour, the South Loop Club (aka the dive bar). Friday March 30th 5:30-7 pm--Lexblog & ABA Journal Beer for Bloggers, Hilton Chicago, Lakeside Green Lounge in lobby. You can also sign up for the Taste of Techshow dinners that aren't yet full here. I'll be all over the place at Techshow this year, but now that I'm VP of Business Development and Community Relations for law practice management software company MyCase, I'll undoubtedly be spending most of my time at the MyCase booth, #314, and would love to meet you and would be happy to sign either of my ABA books if you stop by the booth. You can also find me at the "Meet the Author" session for my most recent ABA book "Cloud Computing for Lawyers" on Friday March 30th at 1:45-2:15 in the author lounge. Techshow's almost here and I can't wait! Hope to see you there! This week's Daily Record column is entitled "NC Bar Council issues final opinion on the cloud." The use of cloud computing products by lawyers in their law practices is an emerging trend — and one that presents unique ethical issues for lawyers who intend to store confidential client data on servers owned and operated by third parties. A number of ethics committees across the country have offered their take on the issues presented, but none have wrestled with this issue for quite as long as the North Carolina State Bar Council. The council has been drafting (and re-drafting) its opinion addressing this issue for nearly 1 1/2 years now, having released a number of proposed drafts for public comment. Finally, at long last, the council issued its final opinion, 2011 Formal Ethics Opinion 6 (online: http://tinyurl.com/ncsaas), on Jan. 27. The opinion answered 2 questions: 1) May a law firm use SaaS (Software as a Service — a form of cloud computing)? and 2) Are there measures that a lawyer or law firm should consider when assessing a SaaS vendor or seeking to minimize the security risks of SaaS? Long story short, the council gave the use of cloud computing by lawyers its stamp of approval. The council emphasized the lawyers who take advantage of utilizing emerging technologies such as cloud computing in their practices have an obligation to stay abreast of changes in technology. In other words, adopting new technologies into your law practice is not a one-time endeavor, but rather, is a continuous learning process — and an important one at that. Although the council did not require that lawyers comply with specific requirements, the opinion set forth a number of suggested security measures, including: 1) that, in the event of a cessation of service, the contracts with the provider include information regarding how the cloud computing vendor will handle confidential client data; 2) that the contracts provide for a method of retrieval of data from the cloud computing provider in a readable, non-proprietary format; 3) that the lawyer carefully review the contracts with the provider and understand the security issues presented; 4) that the lawyer carefully evaluate the security measures used by any company involved in the hosting of the lawyer’s confidential client data, including “firewalls, encryption techniques, socket security features, and intrusion-detection systems;” and 5) that the lawyer thoroughly evaluate the provider’s data back up procedures. Finally, of particular import was that the council recognized that absolute security is an impossibility and thus is simply not required. Oftentimes, the battle cry of lawyers opposed to using cloud computing platforms to store confidential client data is that such platforms are not, by their very nature, secure since third parties have access to the data. Although it took the North Carolina State Bar Council almost two years to reach this decision, the good news is that the end result is a fair and thoughtful opinion that allows North Carolina lawyers to take advantage of emerging technologies like cloud computing. This opinion is an improvement over prior drafts and it is evident that the council listened to and incorporated recommendations from commenters. So, kudos to North Carolina for its hard work and its balanced take on this issue. "The Lawyer's PC," a bi-weekly Thomson West newsletter recently published a review of my newest ABA book, "Cloud Computing for Lawyers." The article was titled "Cloud Computing for Lawyers: Details and Insights Into 'the Future' of Law Firm Tech." The book contains a chapter on “Ethical Implications of Cloud Computing in Law Practice” guest-authored by Stephanie Kimbro, a legal technologist who operates a Web-based law practice. Throughout the volume, Black augments her own material with input by practicing lawyers from many backgrounds. The book is well organized, well written and easy to follow. It's an excellent read for legal professionals who want to educate themselves about working in the cloud. It should interest, too, those in law firms that are well-established in the virtual realm. And at the other end of the spectrum, it should prove enlightening for those who are uninterested in cloud computing (but who are unwittingly engaged in it). I’ve just started reviewing Niki’s book and what I’ve seen so far is very readable and highly informative. If you’ve been sitting back, watching this whole legal cloud computing thing develop before you take the plunge, this is a great book to get up to speed right away. It’s not a technical volume, but rather explains how the cloud benefits a law practice, explains the techie mumbo-jumbo from a high level, and then delves into the pragmatic aspects for law firms. Stephanie Kimbro, another founding member of the Legal Cloud Computing Association and North Carolina lawyer, contributed a thorough chapter, “Ethical Implications of Cloud Computing in Law Practice” which lays out the issues of Model Rules and procedural rules as well. This chapter is worth the purchase price of the book in and of itself. Thanks so much Dan and Larry for these wonderful reviews! 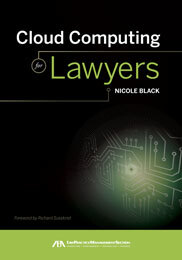 If you're a legal professional and would like to learn more about cloud computing, you can buy my book here. 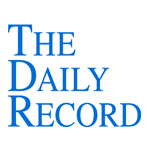 This week's Daily Record column is entitled "iPad Apps for the Traveling Lawyer." If you’re a lawyer with an iPad or an iPhone and you travel frequently, this article was written just for you. In it you’ll learn about the latest travel apps and how you can use them to make your travels more organized, pleasurable and relaxing. First, use your mobile device (many of these apps are available for Android devices as well) to plan your trip. Download Kayak and Trip Advisor, both of which are free and available for either the iPhone or iPad. Use the Trip Advisor app to read your fellow travelers’ reviews of hotels, restaurants, and attractions at your chosen destination. You can then use that app to book a flight or hotel reservation. Or, if you want to compare prices offered by hundreds of different travel sites, use Kayak to book your flight, hotel and car reservations. Then, download the TripIt app, a free app for both the iPhone and iPad. Forward all of your itinerary confirmation emails to TripIt, so that you’ll have all of your itineraries for your trip in one place, easily accessible via your mobile device. Next, prepare for your trip. Get ready for the airport security checkpoint by downloading the free My TSA app. This app is issued by the Transportation Security Administration and provides quick access to everything you need to know about the airport security process, including wait times at various airports and other useful information such as TSA procedures and which items you can take through checkpoints. Two other free apps useful for international travel are iTranslate, which provides translation for over 50 different languages via voice recognition and speech output, and the Currency app, which provides up-to-date currency exchange information. Once you arrive at the airport, take advantage of the GateGuru, a free iPhone app. This app provides maps of major airport terminals, including restaurants and stores, along with citizen reviews of various businesses located in the terminal. While waiting for your flight, catch up on the latest legal news using any number of free apps, including the LexisNexis Legal News app, the ABA Journal’s app or Findlaw’s legal news app. Once you arrive at your destination, find a place to eat based on reviews from other diners using the Yelp or Urbanspoon free apps. Then, make reservations using the OpenTable app and hail a taxi using the Taxi Magic app. For free information about other businesses, including stores, gas stations, restaurants, coffee shops, etc. near your hotel, try the Around Me app. And if you’re interested in learning about local events or excursions, the Goby app is just what you need. Finally, make sure to have the free Fastcase app available in case you need to conduct last minute legal research and be sure to download one of the many free scanner apps as well. That way, if necessary, you can scan documents using your iPhone’s camera and then email PDFs of the documents to your office. These days, air travel isn’t always the most pleasant experience, especially in this post-9/11 era. But at least there are mobile apps available to help streamline the process by putting all the information you need right at your fingertips. While air travel will never be perfect, these apps should help to make the process less stressful and more enjoyable.